Although Apple didn’t confirm the iPhone event yet for September 10, three different sources deeply connected with Apple already have confirmed it. This will be the date when Apple is expected to present the iPhone 5S and the iPhone 5C. But how will they be priced? Horace Dediu of Asymco has a pretty interesting theory. After putting the available pricing information together, he says the answer may be in the way the iPad mini has been marketed, mainly because the iPhone pricing pattern is regular, but there is a different pricing strategy with the iPad. The average selling price (ASP) of the two products lines reveals an interesting story: assuming that the iPhone 4 and 4S will be retired, Dediu says. 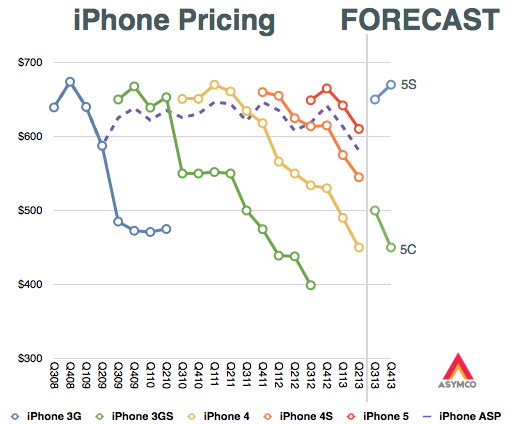 The lower-cost iPhone, the 5C, will take up the trajectory of the 4S, and the iPhone 5S will take the upper bracket. This puts the iPhone 5C price between $400 and $500 — which could reinforce an earlier iPhone 5C price rumour — while the high-end handset will continue to be priced as usual. If you look at the iPad, ignoring the legacy iPad 2 (which I presume sells mostly to educational institutions) the replacement of the iPad 3 was with a “bracketed” portfolio of the higher-priced iPad 4 and the lower-priced iPad mini. 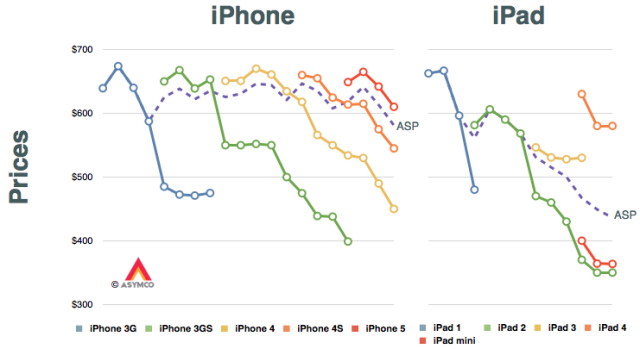 Note also that the mini reflects similar pricing to the legacy iPad 2. My second assumption is therefore that the 5S and 5C will form a similar bracket as the new iPads did. I also assume that the iPhones 4 and 4S will be retired. This means that the 5C will take up the trajectory of the 4S while the 5S will take up the upper bracket around $650. This doesn’t mean though that lower-cost iPhone buyers will need to shell out $450 to put their hands on the handset, because Dediu’s projection doesn’t talk about the end-user pricing. This could be the price of an unlocked iPhone 5C.